At some point in their young lives, most little girls go through a princess phase. They might be enchanted by the ideas of castles, horses, ball gowns and sparkling tiaras or they could have seen a Disney movie that captured their hearts. If your daughter asks for a princess party when her birthday rolls around, here are some ideas to make the day unique and memorable. Just remember: although there are a plethora of princess products on the market, you don't have to go with a commercial princess theme. You can save money and add a personal touch to the party by creating the decorations and supplies yourself. Princess parties should be announced in a royal fashion. Send invitations that use a fancy text and glitter. They could be shaped like horses, unicorns, tiaras, glass slippers or rainbows. You could paint your own pretty princess picture or make something simple, like a cutout of the age your child is turning with a tiara perched on top of the number. Speaking of tiaras, how about delivering one plastic tiara to each party guest with a tag attached that lists the who, what, where and when of the party? Somewhere on the card, ask the girls to wear their new crowns to the party. If boys are invited, replace the tiaras with crowns or inflatable toy swords. You could also make an old-fashioned looking party invitation by printing out the party information on paper using an elaborate font, dipping the paper in dark tea to age it, letting it dry and rolling it up like a scroll. When it comes to princess party decorations, think pink! Pink plates, pink napkins, pink streamers, pink balloons. Or, go with a regal purple or the birthday girl's favorite colors. To give basic party hats a princess touch, cut a piece of tulle that's about six inches by 18 inches long. Tie a double knot at one end, then pull the unknotted end through the small opening at the top of the hat, creating a tail of fabric that flows behind the guests as they wear the hats. The double knot should catch at the top of the hat, preventing the tulle from sliding out. If the opening at the top is too wide, though, staple or tape the knotted end of the tulle in place. The boys can wear crowns or black or silver party hats to resemble knights. Hang a unicorn or rainbow piñata that's filled with small toys and candy. Order an arch of rainbow-colored balloons from a balloon business or make one yourself using a balloon arch kit. Display it over the food or gift table or place it near your front door so the guests must walk under it to enter the party. Purchase a bubble-making machine and let it run throughout the party so soap bubbles constantly float around the party guests. Cover chairs with organza slipcovers, which you can purchase or make yourself following directions in the book by Kaari Meng. Cover tables with pink tablecloths, then drape a layer of organza on top. Boys' tables could be covered with black and silver. Hang tissue-paper pompoms from the ceiling. Depending on what time of day you hold the party, you'll either need to serve a full meal or just snacks and dessert. It's fun to give the menu a princess theme, too. You could set out tiny tea sandwiches and serve pink lemonade or juice in teacups. The sandwiches also could be cut into princess-themed shapes using cookie cutters. What princess party is complete without a basket of (un)poisoned apples or a bowl of magic potion (i.e., your favorite punch recipe)? To present chips or cut vegetables in a clever way, hollow out a pumpkin, line it with plastic wrap and place the snacks inside. You could rest the pumpkin on two axels made from chopsticks or wooden dowels with round doughnut "wheels" placed on the ends. Your princess party might have a sub-theme that guides the menu. If your daughter likes the story of Jasmine and Aladdin, for example, serve kid-friendly Indian food. If she's a Little Mermaid fan, serve fish sticks and other beachy snacks. Check out the book Princess Tea Parties, by Janeen A. Sarlin, for more menu ideas that fit global and make-believe princess themes. One popular idea is to make a castle-shaped cake using a molded cake pan or to build one yourself using cakes made in loaf pans and adding ice cream cones that serve as turrets. How about following a princess and the pea cake idea from Family Fun that involves stacking several rectangular cakes that are frosted different colors or covered in various fondant designs so they look like mattresses. Place a fondant princess or a plastic doll on top, under a fondant bedspread, and set a green “pea” made from fondant or frosting at the bottom of the mattresses. The classic Barbie doll plunked in the middle of a cake “skirt” is always a hit, as are cakes shaped like tiaras and magic wands. Looking for an inexpensive and easy princess dessert idea? Buy frosted cupcakes from a grocery-store bakery and then top them with some sort of decoration, such as plastic rings or tiny tiaras. Be careful, though, if babies or toddlers are attending your party. Serve them plain cupcakes so they don’t choke on the toys. If you’ve ever worked with fondant, you know that making shapes from it is as easy—and fun—as working with play dough. Buy pre-packaged fondant from a cake-decorating or craft store and work it into princess-themed shapes, such as pumpkins, glass slippers, frogs, and crowns. Place one edible figure on top of each cupcake. Instead of cake or cupcakes, you could also bake cookies in star-shaped pans and then insert sticks into them so they look like magic wands. Tie a pink ribbon around the stick where it meets the cookie to dress it up a bit. Play dress up. Borrow several princess costumes from the make-believe closets of friends’ kids and set up a dressing room where the girls can get ready for the ball. Face painting. Ask an artistic friend or teenager to paint pictures on the girls’ cheeks. Or make the girls feel fancy with some lip gloss, nail polish and sticker earrings. Dance the day away. Once the girls are dolled up, play some music and let them dance. It could be classical or pop music. Many young girls seem to like pop idol Taylor Swift’s song “Love Story,” which has a fairytale theme. If the girls get tired of just dancing, play a game of freeze dancing, where an adult stops the song at random points and the kids must freeze mid-motion until the music starts again. Set up a table for making princess crafts. Lead the girls in some friendly competition with princess party games that will get them moving and giggling. If you have time and your guest list is manageable, make each child a princess-and-the-pea toy made from scrap fabric and felt. A box of treasures, including shiny rocks you could pass off as crystals, a bottle of soap bubbles, stickers and plastic rings. If your child is enthralled with a particular fairy tale or Disney princess, consider these ideas for tying them to the party theme. Include gummy frogs in the goody bags. Give the whole party a New Orleans theme, serving beignets and mild jambalaya. Hang large green leaves from the ceiling and doorways to make it look like the bayou. Play Pin the Lips on the Frog by drawing a large frog picture, taping it to the wall and then giving each child a set of red paper lips to tape onto the frog’s mouth while blindfolded. Disney Family has several other Princess and the Frog party ideas on its site. Make the pumpkin chip bowl mentioned in the menu section above. Give each child a pair of inexpensive clear jelly shoes or clear-plastic flip flops as a party favor. Be sure to find out their sizes beforehand. Have the kids make a clock craft during the party, give them inexpensive plastic watches as favors or make them felt watches instead. Shape the cake like a pumpkin carriage or a clock that’s frosted to look like it’s about to strike 12. The party favors could also be metal pails (to imitate mop buckets) filled with candy and some cleaning supplies, such as a feather duster and sponges. Make a castle-shaped cake, but instead of frosting it, glaze it with icing and then sprinkle crushed vanilla cookies or graham crackers to mimic sand. Set out fishermen’s netting and fake rubber fish on the food or gift table. Hang more netting from the ceiling and doorways. For each child, make a simple mermaid tail they can wear during the party and take home as the favor. Include Swedish fish candies in the goody bags. In honor of Belle’s love of books, give each child a book (either new or secondhand) as a favor at the end of the party. Decorate with red roses or place a single red rose under a glass cloche in the center of the food or gift table. Play games such as pass the enchanted rose or be our guest table setting race. Set out a basket of red apples on the food table, as mentioned above. Have the kids play Seven Dwarfs charades. Depending on which name they draw, they have to act out being grumpy, sleepy, happy, etc., without talking. The other children must guess the character that’s being portrayed. Distribute Shrek ears at the start of the party for everyone to wear. Serve green foods, such as grapes, honeydew melon, kiwi, sugar-snap peas and lime sherbet punch. Ask a baker to create a 3D cake that resembles Shrek and Fiona’s home in the swamp. Play pin the tail on Donkey (well, duh!). 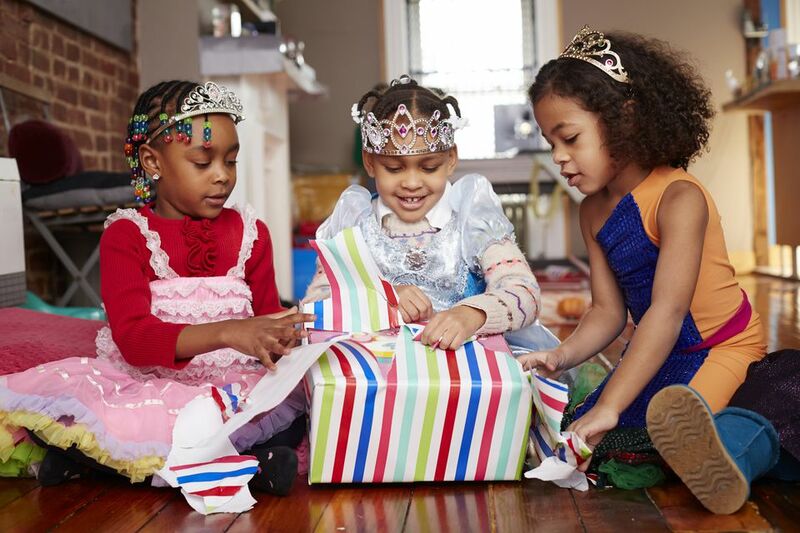 Can't decide which princess to make the center of your child's party? Set up a station for each one and let the guests travel from table to table. They'll have a ball, but you might need your beauty sleep when it's over.